Nat CATs in Asia - Special Roundtable Focus: How can the industry do more? Sharing his experiences, Professor Pan Tso-Chien, Executive Director of the Institute of Catastrophe Risk Management at Nanyang Technological University, Singapore, noted that although the engineering community and authorities could be encouraged to strengthen buildings and infrastructure and the policies which govern them, the deeper issue is that many governments still pick up the tab when losses occur. “This does not help insurance take-up rates, and eventually goes back to taxpayers,” he said, adding that there is a disjoint among the three key elements – of engineering (which is a design process for building and infrastructure protection); social and government policy (which is for the good of society), and the financial community (represented by insurance which has the notion of profit making in picking up the losses and providing monetary protection to the affected). The crux lies in persuading consumers that all the three elements are necessary for protection, including realising that insurers need to find sustainability in the business. (example: a corporation does not get charged if it retains a risk; but if it insures that risk, it’s insurers who get a capital charge for it). There were also concerns with the notion that S&P was planning to include risk management elements like climate change into its rating analysis. Mr Ahmed was appointed Chief Executive Officer of Allianz Re on 1 January 2012. Before, he had held the role of President of Allianz Re since 1st June 2010, with responsibility for the day to day operations of the company. Mr Ahmed joined Allianz Re as Chief Risk Officer in May 2007. Prior to this he was Chief Risk Officer and Member of the Board at Allianz Global Corporate & Specialty. Mr Ahmed studied Mathematics at Bristol University and started his career consulting at William M Mercer, subsequently serving in various actuarial and management positions at Odyssey Re. He joined Allianz Global Risks as Chief Actuary in 2002. He is a Fellow of the Institute of Actuaries. Professor Pan is the Founding Executive Director of the Institute of Catastrophe Risk Management (ICRM), Nanyang Technological University (NTU) in Singapore. He received his PhD and MS degrees from the University of California at Berkeley in USA, and his BS degree from the National Cheng Kung University in Taiwan. Prof Pan joined the NTU faculty in 1985 and has served for five years as NTU’s Dean of the College of Engineering before taking on the leadership of ICRM at NTU in 2011. Prof Pan specialises in the analysis and design of structures against earthquake ground motions and other dynamic loading. He has made important contributions to both the national and international research communities. Prof Pan is currently Secretary General of the World Seismic Safety Initiative, International Association for Earthquake Engineering. He is also a Fellow of the Academy of Engineering, Singapore, and a Fellow of the ASEAN Academy of Engineering and Technology. Mr Beedle started his career in 1990 in the London property retrocession market at a time of significant Nat CAT activity, which began in 1989 with Hurricane Hugo and was followed in quick succession by a number of European windstorms at the same time. Having moved to Australia, he was involved in a number of large property catastrophe programmes before moving to Japan to work with a global group placing some of the largest limits in the world. At that time, Mr Beedle experienced first-hand the 2011 Tohoku Earthquake. He has actively been involved in building Willis Re’s analytical capabilities, critical to the quantification of catastrophe risk in addition to contributing to UN and OECD sponsored events focusing on societies’ resilience to severe weather events. As Head of Agriculture for the Asia Pacific Region, Mr Book is part of Allianz’s Global Agriculture team. Working together with Allianz Group Companies and third party entities, he oversees the development of agriculture insurance and reinsurance in the Asia Pacific region. Prior to joining Allianz, Mr Book was at Guy Carpenter as the Head of Agriculture Asia Pacific. He led Guy Carpenter’s regional agriculture specialty practice with responsibility for the development, execution and deployment of sales and technical strategy across the region. Prior to joining Guy Carpenter, he spent nine years as a Senior Underwriter and then Underwriting Manager of Primacy Underwriting Agency (now part of the Allianz Group). Mr Book holds a Bachelor of Applied Science degree in Systems Agriculture from the University of Western Sydney in Australia. He is a Fellow of ANZIIF and a member of Australasian Institute of Chartered Loss Adjusters (AICLA). Mr Coe is Head of Agriculture for Aon Benfield for Asia Pacific and works in the Singapore office. He has been working on Agricultural business for 19 years, in several different territories. 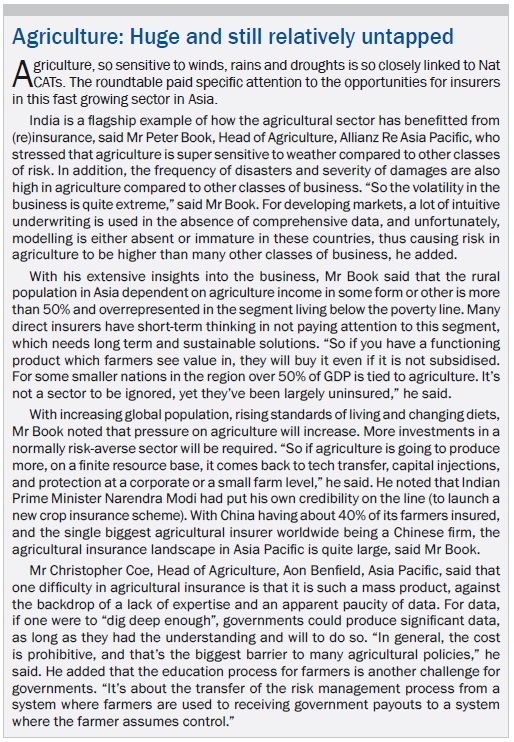 He has experience of crop markets where there is no government subsidy, like South Africa and Australia, where some multi-peril insurances are sold alongside the main hail products. He has been involved in the Asian Agricultural business since the introduction of government premium subsidies, for the last 11 years. Mr Coe also has extensive experience in India, South Korea and China, finding reinsurance capacity for Crop, Livestock, Forestry and Aquaculture business. He is involved with clients and reinsurers in developing agriculture insurance schemes and advising on the structure and the rating of new schemes, using the resources of the experienced Aon Benfield analytical team. Mr Domingo has more than 39 years of insurance experience both in the life and non-life insurance industry. With formal training as a CPA, he worked his way through the different facets of insurance operations which prepared him later to be the Chief Operating Officer of one of the biggest insurance companies in Philippines. He was formerly Chairman and President of the most successful insurance pool for engineering business in the Philippines, composed of the major players in the market. Just before being posted in Singapore, he handled the underwriting, claims and reinsurance operations of the 3rd biggest insurance companies in the market in partnership with MSIG. Mr Domingo spent many years in finance, sales, claims, reinsurance and especially in underwriting operations and is aware of the challenges being faced by the industry in the management of Nat CAT risks in a country most exposed to it in the ASEAN region. Mr Jain is Vice President and Managing Director of AIR Worldwide Singapore operations. He is responsible for overall management of AIR Singapore operations, including client services, research, business development, marketing in Southeast Asia and Australia/New Zealand. Mr Jain has over 12 years’ of experience in the field of Catastrophe Risk Management and has worked extensively with insurers & reinsurers to perform catastrophe analyses, interpret analysis results, optimize modelling workflows and, ultimately improve risk management practices. Mr Jain earned his MBA from ICFAI Business School, Hyderabad, India with specialisation in Insurance & Risk Management. He has also achieved the designation of Associate in Reinsurance (ARe) and Associate in Risk Management (ARM) from the American Institute of Chartered Property Casualty Underwriters. Mr Jones is the Principal Officer and Chief Executive Officer of Guy Carpenter Singapore, and leads the Treaty business emanating from Southeast Asia, South Korea and India. Mr Jones has over 25 years of Asian market experience. Prior to relocating to Singapore, he worked in the Asia Pacific team of Guy Carpenter in London. Mr Khandar is Catastrophe Management and Enterprise Risk Management professional experienced in major (Re)insurance markets across the globe including US, Bermuda, London, Asia Pacific and Japan. 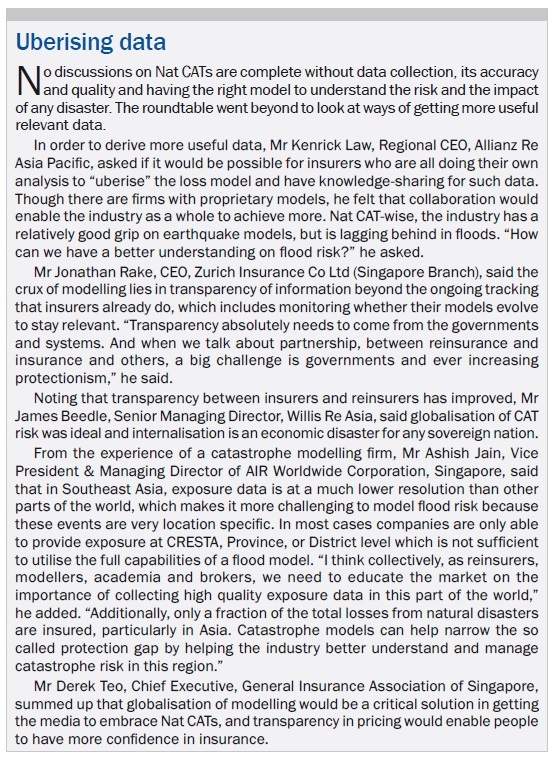 His recent leadership positions include that of establishing a catastrophe management function in Asia Pacific for AIG; and developing catastrophe risk modelling and research team in Singapore, for a Bermudian/ Japanese natural catastrophe treaty reinsurer writing worldwide coverage. He has been invited to various CAT, Actuarial, Underwriting, and Risk Management conferences as an expert speaker on catastrophe management. Mr Khandar is a Certified Enterprise-wide Risk Manager from ARIMI, Certified CAT Modeller from AIR, and holds a Master of Technology in Civil Engineering from IIT Delhi. Since May 2014, Mr Law leads Allianz SE Reinsurance Branch Asia Pacific as Regional CEO and Head of P&C Client Management Asia Pacific. He oversees all issues for Allianz Re in the Asia Pacific region, and on the business side in particular the P&C business. Having been with the insurance and reinsurance industry for 20 years, Mr Law has held several key positions. After completing his degree in Master of Arts, Economics, he started his professional career under the Asian Trainees Program at Swiss Re in Switzerland and South Africa. He then moved to Swiss Re Hong Kong holding various roles from Treaty Underwriting Manager to Head of Casualty Treaty Underwriting, Asia. Prior to Allianz Re, Mr Law was the Executive Vice President, Client Management at Asia Capital Reinsurance Group Singapore. Mr Rake has worked in the large corporate insurance segment for the 14 years. His involvement with large multinational programmes has provided him with a good insight into challenges faced by MNCs operating in areas prone to natural catastrophes. Mr Rake’s understanding of the customer needs and insurance solutions the industry can provide to mitigate these risks and respond to these events are relevant in his role as Zurich’s Country CEO of Singapore. His responsibility not only covers the Singapore domestic market, but business from the broader Asia Region. As a World Economic Forum Young Global Leader, he is regularly engaged with governments and the private sector on topics concerning the role of insurance in addressing the impacts of climate change in this Region. Mr Teo is the Chief Executive of the General Insurance Association of Singapore (GIA) and was the elected President of GIA from 2005 until 2013. Mr. Teo has been actively involved in the GIA’s activities since 1986 and has served on various committees. In addition, Mr. Teo was elected to key positions in the Singapore Insurance Institute (SII), serving as elected Vice-President in 2002 and President in 2003 and 2004. A veteran in the general insurance industry for over 40 years, Mr. Teo has held senior management positions where his leadership has transformed business models, and brought consistent profitable growth in consumer lines business. Prior to GIA, he was with AIG Asia Pacific Insurance Pte Ltd where he was Executive Vice-President from 2004. In 2013, he was awarded the Institute of Banking & Finance (IBF) Distinguished Fellow. Mr Teo is also an Associate of the Chartered Insurance Institute, United Kingdom.